After a lifetime of watching financial markets, the speed at which traders react still amazes me. Sometimes it seems to me like they hail from the “ready, shoot, aim,” school of thinking. Economic trends almost never turn on a dime; and though we can look back and find a moment that was the exact bottom or top, there were forces building that caused people to move from one side of the boat to the other, tilting the economy or markets or society in a different direction. New data can alter our probabilities – but rarely as fast as trading algorithms seem to think. Long-term trends, by definition, change slowly. Now, as I reflect, I see how the various crisis forecasts fit Neil Howe’s “Fourth Turning” formula. Today I’ll tell you why. I’m going to do something a little different in this letter in that I’m going to borrow wholesale from Neil’s speech at the conference and his voluminous writings in order to give us a view of what to expect in the next five to eight years. And given that the Brexit vote looms next week and that it’s part and parcel of what Neil is talking about, I will offer some final thoughts on Brexit. That should be enough to keep us occupied for the next few minutes. Before we dive in, let me note that I realize this letter is very US-focused. That said, the concept of generations and turnings is not just a US or Anglo-Saxon phenomenon. All nations, all peoples, experience their own recurring cultural seasons and changes. No part of humanity is exempt from this process. Some of my best late-night conversations with Neil have been about the generations and turnings of different countries (especially China). Sometimes, at the end of the evening, I wish that I had secretly recorded our conversation so I could have it transcribed and review it later. Alas, I’ve never had the foresight to do so. I think the framework of “generational change,” and specifically the concept of the Fourth Turning, originally appeared in a 1997 book by that name, written by Neil Howe and William Strauss (who, very sadly, died a few years ago from pancreatic cancer – a great loss) are very important in understanding what is happening in our society. The concepts don’t attempt to explain the current turmoil in its entirety, but they do enable us to frame our thinking about our time in context, in the stream of history. It is one of the great ironies of life that each generation believes its experiences are unique. This is not unlike teenagers thinking that their parents can’t possibly understand the emotions pouring through them, certain that the old fuddy-duddies could never have experienced such emotions themselves. The reality is that we have seen this movie before – with different actors and main characters and plot twists and technological devices, to be sure – but the basic plot seems to push along a hauntingly familiar path. I have to warn you: some of what follows won’t be encouraging because, as Neil says, we’re in a Fourth Turning. Fourth Turnings are crisis periods, and we are barely halfway through this one. But take heart: better times await us on the other side of the crisis. Neil has a research service that looks at how generations affect markets and economics and products and companies. I find their work fascinating. The service is not cheap, but if you are running a major fund or are responsible for choosing specific investments, I think you will be richly rewarded with ideas and insights for your dollar. You can learn more about Neil’s firm at www.saeculumresearch.com. You can also see six free videos of interviews of Neil discussing a wide variety of subjects, at Hedgeye.com. And now I will try to take my notes from Neil’s speech and my familiarity with his writings and distill the essence of his lessons. This letter will not substitute, though, for your actually buying The Fourth Turning and reading it; and those who want further understanding can go back and read Strauss and Howe’s previous book, Generations: The History of America's Future, 1584–2069. Every parent who has watched children grow into adults knows that our personalities form early in life. Psychologists from Sigmund Freud forward have generally agreed: our core attitudes about life are largely locked in by age five or so. Changing those attitudes requires intense effort. Howe and Strauss took this obvious truth and drew an obvious conclusion: if our attitudes form in early childhood, then the point in history at which we live our childhood must play a large part in shaping our attitudes. Howe and Strauss added a corollary: it’s not just early childhood that forms us. We go through a second formative period in early adulthood. The challenges we face as we become independent adults help determine our approach to life. These insights mean we can divide the population into generational cohorts, each spanning roughly twenty years. Each generation, then, consists of the people who were born and came of age at the same point in history. They had similar experiences and thus gravitated toward similar attitudes. Members of each generation are also individuals, of course. Family and other circumstances leave each person more or less attached to the broader attitudes of their time. Generational attitudes don’t determine everything, but they’re still important. Amusing, yes, but true. Young love, a universal experience, took different forms for Americans who grew up in the 1950s vs. the 1970s vs. the 1990s. Ditto for many other aspects of life. Until recently it was unusual to have more than four generations alive at the same time. Improved longevity means we now have six generations among us. Our oldest citizens are from the “G.I. Generation,” or what Tom Brokaw famously called the “Greatest Generation.” Born from 1901–1924, their childhood milieu included World War I and the prosperous Roaring ’20s. As young adults, they experienced – and eventually overcame – the challenges of the Great Depression and World War II. Those two generations have now either passed away or are well into retirement. They control a great deal of wealth, which gives them influence, but they no longer wield the levers of power. That role now belongs to the Baby Boomers (born 1943–1960) and increasingly to Generation X (born 1961–1981). Next in line are the much-discussed Millennials (born 1982–2004) and then today’s young children, whom Howe dubs the Homeland Generation (born 2005–2025?). The social and economic influence of these latter two generations is growing as that of the Boomers and Generation Xers declines. In their unbelievably prescient and prophetic 1997 book, The Fourth Turning, Howe and Strauss identified four generational archetypes: Hero, Artist, Prophet, and Nomad. Each consists of people born in a roughly twenty-year period. As each archetypal generation reaches the end of its 80-year lifespan, it is replaced by a new generation of the same archetype. Each archetypal generation proceeds through the normal phases of life: childhood, young adulthood, mature adulthood, and old age. Each tends to dominate society during middle age (40–60 years old), then begins dying off as the next generation takes the helm. The change of control from one generation to the next is called a “turning” in the Strauss/Howe scheme. The turnings have their own characteristics, which I’ll describe shortly. 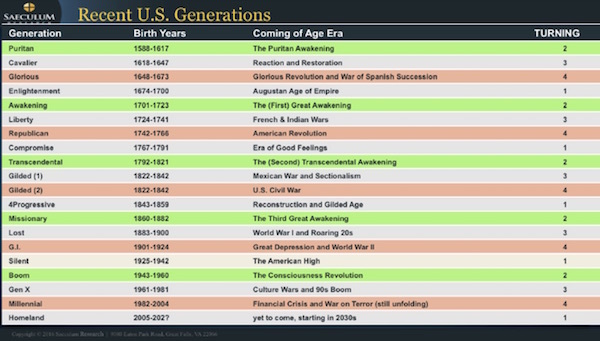 First, let’s look at the archetypes and how they match the generations alive today. The characteristics of each archetype aren’t neatly divided by the calendar; they are better seen as evolving along a continuum. (This is a very important point. It is why we get trends and changes, not abrupt turnarounds. Thankfully.) People born toward the beginning or end of a generation share some aspects of the previous or following one. Obviously, individual differences can also outweigh generational identity for any particular person. (We all know people who were seemingly born in the wrong era.) The archetypes simply describe broad tendencies that, at the larger societal level, add up to significant differences. Hero generations are usually raised by protective parents. Heroes come of age during a time of great crisis. Howe calls them heroes because they resolve that crisis, an accomplishment that then defines the rest of their lives. Following the crisis, the Heroes become institutionally powerful in midlife and remain focused on meeting great challenges. In old age they tend to have a spiritual awakening as they watch younger generations work through cultural upheaval. The G.I. 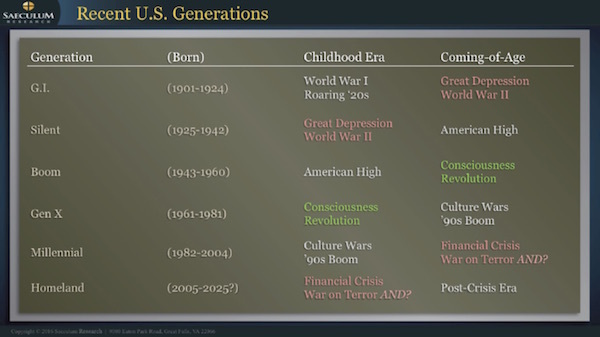 Generation that fought World War II is the most recent example of the Hero archetype. They built the US into an economic powerhouse in the postwar years and then confronted youthful rebellion in the 1960s. Further back, the generation of Thomas Jefferson and James Madison, heroes of the American Revolution, experienced the religious “Great Awakening” in their twilight years. Artists are the children of heroes, born before and during the crisis but not old enough to be an active part of the solution. Highly protected during childhood, Artists are risk-averse young adults in the post-crisis years. They see conformity as the best path to success. They develop and refine the innovations forged in the crisis. Artists experience the same cultural awakening as Heroes, but from the perspective of mid-adulthood. Today’s older retirees are mostly artists, part of the “Silent Generation” that may remember World War II but was too young to participate. They married early and moved into gleaming new 1950s suburbs. The Silent Generation went through its own midlife crisis in the 1970s and 1980s before entering a historically affluent, active, gated-community retirement. Prophet generations experience childhood in a period of post-crisis affluence. Having not seen a real crisis, they often create cultural upheaval during their young adult years. In mid-life they become moralistic, values-obsessed leaders and parents. As they enter old age, prophets lay the groundwork for the next crisis. The postwar Baby Boomers are the latest Prophet generation. They grew up in generally comfortable times with the US at the height of its global power. They expanded their consciousness when they came of age in the “Awakening” period of the 1960s, defined the 1970s/1980s “yuppie” lifestyle, and are now entering old age, having shaped the culture by virtue of sheer numbers. Nomads are the fourth and final archetype. They are children during the “Awakening” periods of cultural chaos. Unlike the overly indulged and protected Prophets, Nomads go through childhood with minimal supervision and guidance. They learn early in life not to trust society’s basic institutions. They come of age as individualistic pragmatists. The most recent Nomads are Generation X, born in the 1960s and 1970s. Their earliest memories are of faraway war, urban protests, no-fault divorce, and broken homes. Now entering mid-life, Generation X is trying to give its own children a better experience. They find success elusive because they distrust large institutions and have no strong connections to public life. They prefer to stay out of the spotlight and trust only themselves. Their story is still unfolding today. After the Nomad archetype, the cycle repeats with another Hero generation, the Millennials (born from 1982 through about 2004), who are beginning to take root in American culture. They are a large generation numerically, filling schools and colleges and propelling new technology into the mainstream. If the pattern holds, they will face a great crisis. It will influence the rest of their lives just as World War II shaped the G.I. Generation Heroes. And guess what: we are all in that crisis right now. If Strauss and Howe are correct, the four generational archetypes literally created Anglo-American history. A new era, or “turning,” begins every twenty or so years. Four turnings bring a complete cycle, matching the 80–90 year human lifespan. The Romans used the word Saeculum to describe this length of time, meaning “a long human life” or “a natural century.” In their book Generations, Strauss and Howe outline seven full saecula, going back to the 15th century. Much like the changing seasons, the turnings within each saeculum follow a recurring pattern. The first turning is called a High, a confident time in which social institutions are strong and factions pull together for the greater good. The second turning is the Awakening. This period is marked by cultural and religious renewal – changes accompanied by resistance and conflict. The third turning is an Unraveling. People lose trust in institutions and embrace individualism. The fourth turning is the Crisis, a time of major upheaval when some great threat forces a redefinition of core institutions and public behavior. US history confirms that the pattern is more than coincidental. Begin with a day when crisis was triggered: December 7th, 1941. The attack on Pearl Harbor might not (or at least should not) have been as surprising as many think, but it did mark the onset of a new crisis for a nation already dealing with the Great Depression. Eighty-five years earlier, Confederate forces fired on Fort Sumter, launching the Civil War and redefining the core institutions surrounding state’s rights and individual rights. Dial the calendar back another eighty-five years, and we find a group of men in Philadelphia committing lives, fortunes, and sacred honor by signing the Declaration of Independence. The pattern continues: four generations before the American Revolution our country experienced the 1689 “Glorious Revolution.” One lifespan earlier the English navy defeated the Spanish Armada, which followed by a century the bloody War of the Roses, creating Tudor England as a modern nation-state. Halfway between these crisis periods we see Awakening periods like England’s Protestant Reformation, the American Transcendental era of the 1820s and ’30s, and the 1960s American spiritual and social upheaval. Like the seasons, turnings unfold gradually, almost unnoticeably at first. They can also vary, just as we experience warm autumn days and springtime cold fronts. Social forces drive the turnings, just as planetary forces create seasons. At any given time, four generation are alive: children, young adults, middle-aged, and elderly. Each experiences history from its own perspective. If you were six years old, listening to the radio with your 65-year-old grandmother on December 7, 1941, you heard about Pearl Harbor together. Your reactions, however, were quite different. You were on the way up; Grandma was on the way out. And if you were a young man or woman, your reactions were altogether different from those of the six- or the 65-year-old. Each Fourth Turning is a Crisis. When Howe uses that word, he doesn’t mean a short period of difficulty. He means an existential crisis, one in which society’s strongest instititions collapse (or are severely challenged and stressed) and national survival is in serious doubt. The Crisis can be economic, cultural, religious, military, or all the above. Sound familiar? It should. By Neil Howe’s timeline, we are today about halfway through the Fourth Turning’s Crisis phase. We may have another decade to go. When it’s over, we will be able to look back and see that important changes occurred. If this Fourth Turning is like previous ones, here is what we should see. 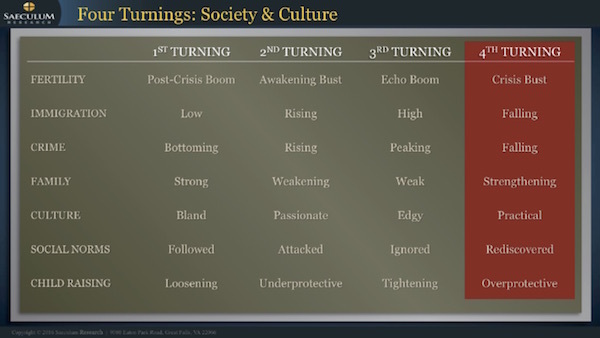 See how the following Fourth Turning characteristics match today’s headlines. Remember, Howe and Strauss were writing all this in 1997, well before today’s events. Rising Community: Notice in the Orlando shooting coverage how often people use the word community to designate the different groups with which people identify. Following the tragic nightclub events, Orlando’s communities drew together to support their members and each other. We see the same behavior in other stressful events. “Je suis Charlie,” the motto that emerged from the January 2015 Paris shootings, comes to mind. Think of all the other disasters we have seen in recent times, and the public response to them. I am not suggesting that community comes to the fore only during a Fourth Turning – far from it. But it does gain strength during such periods. Strengthening Government: Small-government conservatives like me and possibly you are on the defensive. We live in a time when most voters would rather enlarge government than shrink it. We can expect to see stronger government action regardless of who wins this year’s presidential election. Introverted Foreign Policy: Fifteen years on, the U.S. is increasingly tired of the War on Terror. Donald Trump and Bernie Sanders both gained traction in the primaries with a less aggressive approach to foreign engagement. Technology to Scale: The Internet has outgrown its adolescence and entered adulthood. The technology industry now views the Internet as a platform on which to build new capabilities: virtual reality, home automation, video content, and more. Wage Disruption: In the last year we’ve seen major retailers hike hourly pay; $15/hour minimum wages passed in California and elsewhere; and there are growing calls for labor to get a bigger piece of the pie. 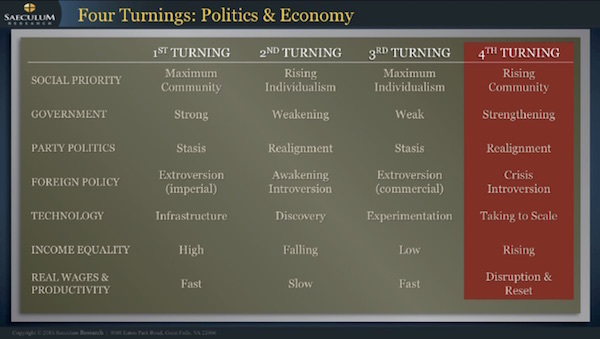 Fourth Turnings bring social and cultural changes, too. Fertility Bust: Birth rates are now near or even significantly below replacement rate throughout the developed world. Much of the Millennial Generation feels financially or otherwise unprepared for parenthood. Falling Immigration: Both the US and Europe are trying to control immigrant flows. Refugees from the Middle East are the exception in an otherwise less migratory world. Falling Crime: Criminal activity varies tremendously depending on where you are, but overall rates are down considerably from the 1980s and 1990s. Practical Culture: The financial crisis forced a new standard of frugality on many Americans in 2008 and afterward. Now it has evolved into the “sharing” economy exemplified by Uber and Airbnb. We even see the trend in fashion: Millennials have little interest in prestige labels and much prefer the low-priced “fast fashion” they can buy at Zara or H&M. Rediscovered Norms: The Fourth Turning is a time when people rediscover the values and norms that launched the previous saeculum. That process can take many shapes, of course, but we may again see the “all-together” ethos that brought the US through the Depression and World War II. Overprotective Parenting: My Baby Boomer peers and I love to recall the unsupervised play and relative independence of our childhood years. Growing up as a country boy on the edge of a small West Texas city, I roamed the woods and ranches of our neighbors. The barbed wire fences were built to keep the cattle in, but they didn’t keep the kids out. We knew which fields had the bulls we wanted to steer clear of. We explored quarries and lakes and rivers, clambered down into caves, and in general did things that would scare the pants off of today’s younger parents. It’s not that my mother didn’t love me; it’s just that in summer, your kid took off with all the other kids and came back in time for dinner. Maybe. We might all end up at someone’s house, eating dinner there. Mothers would call each other, and decisions would get made. I look back now and realize that it was an idyllic time, and I wonder if it will ever come again. Neil’s work suggests it will, but that’s hard to foresee today. Today’s cautious parents won’t let children out of their sight – and often with good reason. As the Crisis unfolds we should see growing concern for protecting children from harm. So after Neil Howe explained all this at the conference, it was time for questions. Naturally I voiced the question that we all want to know the answer to: “Will the Crisis be over soon?” Neil’s answer was succinct, and not encouraging. He thinks we are only halfway through; and if the next few years play out like past Fourth Turnings, the worst is yet to come. Right now we are in a period that roughly parallels the 1930s. Then, Franklin Roosevelt was battling the Great Depression with vast public works and relief programs. Could we do the same now? We could, yes, but we have a problem. FDR had room for fiscal stimulus because government debt was minimal. That is clearly not the case now. The next recession, which would precipitate the next portion of the Fourth Turning Crisis, will see our national deficit balloon to $1.5 trillion; and with the off-balance-sheet requirements, the national debt will grow by $2 billion a year, quickly bringing us to a $30 billion total debt. The government is in hock up to its eyeballs, and the Federal Reserve has used up most of its monetary policy tools. There is little room to add public spending in one sector unless we take it away from another. And the developing Crisis is not just a US problem. Europe is coming to realize that it faces an existential crisis; in Japan Abenomics is losing credibility; and China is well into a period of severe financial and cultural struggle. The emerging markets will be tossed to and fro on the whims of financial flows. Yes, there will be great technological leaps forward, and over the next decade or two we will see three billion people move into the middle class around the world – which will create an even greater potential for cultural change worldwide. But coming back to the US, who among us will give up the goodies we get from Washington so that someone else can have more? While I see a few hands here and there, my reading of the mood of the voters is that they’re not going to willingly hand back their Social Security or Medicare or anything else. I don’t talk to too many people who feel they are not being taxed enough. Dear gods, in some states you are already paying 60% of your income in taxes. Yes, that means you made a lot of money. It also means that many of you have already thought about moving to lower-tax states or changing the nature of your income. That’s the problem we face now. The times are going to force major change upon us, and none of us are going to be very happy about it, because the challenges ahead are going to require a common sacrifice. Admittedly, it’s a different type of sacrifice than World War II required, but it will be just as wrenching to the people who are involved. I really see no way around Crisis – which means we’ll have to plow straight through. The message is, make sure you’re ready. The good news is that we still have some time (even if we don’t know how much time). We can prepare our portfolios and lives to deal with the coming changes. Properly handled, meeting the challenges of a Crisis can be a very positive experience and one that can benefit us as individuals, as well as our families and communities. If you leave your future up to the vagaries of whatever forces are brought to bear upon you, without planning and preparation, you will probably not be happy with the outcome. If you have not read last week’s Outside the Box and the links I put in it, I urge you to do so. As of today, the Brexit vote is really too close to call. Even though the Leave contingent has a small lead in the polls, in other previous separatist votes, like Québec leaving Canada in the ’90s or Scotland leaving the United Kingdom two years ago, the Leave contingent was slightly ahead in the polls but ultimately lost. The Leave voters probably need to have a 3% cushion in the polls to actually pull off a win for Brexit, as it appears that when we actually go into the voting booth, the prospect of real change becomes daunting to some of us, and we reverse our votes. That said, the underlying cultural phenomenon we see is a rejection of the establishment. I’m told by friends who live in Britain that you can’t turn the TV on without hearing some authoritative economist or business leader or politician arguing that it would be an disaster to leave the European Union. The cultural and elite cognoscenti, the establishment, is arguing strenuously, not to say desperately, for staying. And yet there is a huge pushback from people who are more concerned about their day-to-day lives than they are about the fate of their European overlords, and who don’t see that the current leadership has improved things for them. They are seemingly willing to take a chance on the unknown. This cultural angst is not going away, no matter which side wins the vote in Britain on Thursday. It is a phenomenon that is playing out all over the world, but especially in the developed world. Finally, if in fact the vote is to leave the EU, it is not clear what the immediate economic consequences will be. It would be at least two and maybe three years before the final agreements are confirmed and documents are signed. 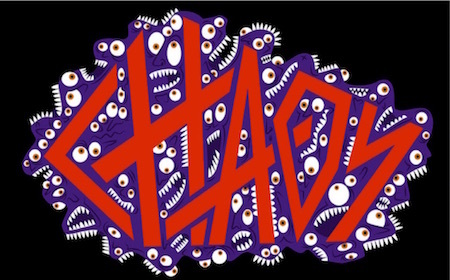 The most important consequence may be the potential for “contagion” to the rest of the European Union. The sense that the EU is a sinking ship will be heightened. The concerns about immigration and lost national sovereignty will come intensely to the forefront. The Deutsche Bank chief economist whom I quoted last week excoriating the European Central Bank for its destruction of the economic prowess of the EU will be joined by many other powerful voices. Where are the strong leaders that Europe needs today? Merkel is increasingly looking beleaguered, and she is going to have to pull back from some of her immigration and economic policies if she is going to survive the vote next year. Hollande is a lame duck who won’t even make it onto the final ballot, where the conservatives and the National Front will likely meet in the runoff. Spain’s next vote is right around the corner, and it is likely to end up with the same decision as last time, which is no decision, with no government able to be formed because of all the splinter parties that won’t work with each other. Italy? It’s having its own crisis and can’t stomach the leadership of Northern Europe. Ninety percent of the Dutch citizens polled this month wanted their own exit referendum. Greece lurches from one crisis to the next. Belgium? You’ve got to be kidding, right? I could add a number of other factors, not just in Europe but globally. And it’s not just economics. Technological change is going to force dramatically different lifestyles in terms of work and social interaction on cultures that are not really prepared for them. And unlike the 1870s through the 1930s in the US, when we went from being a largely agrarian country to one that was largely urban and manufacturing-based, these changes won’t happen over the course of 60 years. The transition will seem more like the twinkling of an eye. And that is precisely what Neil Howe was telling us, back in 1997, that the climactic phase of the Fourth Turning would be like. Were Howe and Strauss looking forward and seeing the Iraq war? Brexit? The rise and then the potential upheaval in China? No, they weren’t making any specific calls. They were simply telling us that at this moment in time this is what happens in a generational turning. It is important that we understand the times we are in. Is our fate sealed? No, not in the sense that we are all doomed and there is nothing we can do about it. We are going to live through a period of stress and crisis. Coincidence? Some will argue so, and maybe they are right. Some argue that seeing history through a generational lens is shaping the facts to meet your story. Okay, you can have whatever narrative you want, but the fact remains that there are forces in the world today that are aligned to bring about a pretty damned serious global crisis and recession. And the recovery from the next recession will be even slower and more frustrating than it has been from the last one, given the response of our central bankers. If you think the mood of the country (pick a country, almost any country in the developed world) is going to be brighter and happier in four years when we are enduring yet another slow-growth recovery (or are still in recession, with high unemployment and all of the stress that creates), then you have a greater faith than I do in our current leadership’s being able to navigate the challenges that loom. Do I think it’s possible that we could avoid or largely mitigate the next recession? Absolutely. I think I can see a path that would lead to an improving economic situation, at least for the US. I don’t see much hope for Europe. But do I think it’s likely that we’ll be so fortunate? Sadly, no. The choices that would have to be made are so radical and so out of the mainstream that the current political, economic, and monetary policy establishment will just not be able to get their heads around them. They would have to reject what are, for them, are core beliefs. I just don’t see it happening. Finally, I suggest that you remember that we will get through this Crisis, whatever it demands of us. Life will go on, and before you know it we’ll be on the other side of the crisis, breathing a sigh of relief and enjoying a “Happy Days” growth era comparable to the 1950s. Our goal is to make sure that we get to the other side of the Crisis as well-prepared as possible, in order to benefit from what will be not just a powerful new bull market but a glorious expansion of human capacity and ability. Speaking of Brexit, I’m going to use it as an excuse to have a party. It turns out the British polls generally report later than we are used to in the US, so that 6:30 PM here in Dallas is a good time to tune in for the results. Surely somebody will be covering the vote live from London. Drop me a note if you’re in the area and want to come by. My special chili, fabulous ham and beans (never cooked together! ), and guacamole and chips are on the menu. Summer, friends, and great conversation – it doesn’t get much better. I was in Cleveland for what was one of the most enjoyable NBA experiences I’ve ever had, watching the Cleveland Cavaliers manhandle the Golden State Warriors. Now, Cleveland came out hot, and Golden State never really got it together. They made some runs but never could get within seven points. Normally, that does not make for a memorable game. What was fascinating was that the normally cool and nonconfrontational LeBron James and the league MVP, Stephen Curry, were increasingly in each other’s faces. We ended up having to switch seats at the last minute, so I didn’t get my “rockstar” seats, but I still sat with my friend Dr. Mike Roizen in good seats that allowed us to watch the Jumbotron easily. It was a little different from being at a Dallas Mavericks game, because the camera focused on the faces of the players more than I was used to. You could easily read their lips and grok their emotions. LeBron and Steph were openly taunting each other, giving each other the “look,” and from time to time accompanying it with a few emotionally charged words and name-calling – not exactly the language I’d want my kids using, but it did punctuate the intensity of the moment. Then Curry got thrown out of the game on fouls, and the crowd went nuts. You could feel the intensity of the players on both sides at that moment. I’ve been watching NBA for 34 years, and that was one of the most entertaining games I’ve ever seen. I will confess that I don’t watch the NBA very often on TV, and I certainly don’t sit and watch a whole game. I hate feeling like I’m wasting time sitting through commercials. It’s not like the Super Bowl where you watch the game in order to see the commercials. But Sunday night I’m going to record the game, and about an hour in I will retreat to my man cave and fast-forward through the commercials to watch this one. I don’t know whether it will be the game of the decade or a blowout, but this is one I don’t want to miss if game six was anything like a hint of the great B-ball to come. Hearing about it after is not the same thing. I know, I said I’m not planning to leave Dallas until I finish my book; but Mark Skousen talked me into coming to his big libertarian blowout in Vegas, called Freedom Fest. Since I’m not really doing a vacation this summer, I thought I could go and moderate a few panels with old friends like Steve Forbes and Rob Arnott. I have tons of friends coming to the conference, and I’ll also do a breakout speech that I’ve have been wanting to do for quite some time but that I know nobody will pay me to do, entitled “The Invisible Hand, Evolution, and Why I Am an Economic Atheist.” It will be a short 20 minutes on a topic I have thought about a great deal and am passionate about. Again, not a commercial speech. Shane and I will catch a few shows (I will once again see the Cirque du Soleil show called “Love,” featuring the music of the Beatles) and spend time with friends. I will even catch some of the other conference speeches and panels. You can see the lengthy list of speakers and topics by going to freedomfest.com. It happens July 13–16 at the Planet Hollywood casino. I think there will be something like 2,000 attendees, representing all wings of the libertarian world. Trump spoke there last year, and I think Gary Johnson is speaking this year. Then I’ll be back home until the first week of August, when I will head to our annual Maine fishing trip with a bunch of unruly economists. Afterward, I’ll show up in New York for a few days. Then my calendar is travel-free until the middle of September. Okay, this letter has run long, so I will hit the send button and wish you a great week. June 20, 2016, 4:30 p.m.
We may well be part way through another Fourth Turning but I doubt very much that previous ones had the potential to be as catastrophic as this one still has the potential to be. Totally off the chart financial developments (negative interest et al), the ability to blow ourselves up many times over, generally pathetic leadership and a rapidly developing, them v us, situation between Islam and Christianity doesn’t bode well. June 19, 2016, 11:10 p.m.
John, I am surprised a smart guy like you did not connect the dots. The Fourth Turning, Brexit, immigration, globalism, and EU are related to the same exact thing, central bank currency debasement. The winners love currency debasement, the elites, buying up the world with counterfeit currency. The poor 99% are the losers, having their savings wiped out by currency debasement, printing unlimited currency units. The poor are flooding the first world nations to get in on the money. The middle class is being wiped out. The poor are subsidized. The rich 1% get filthy rich. The Dow was 995 silver dollars in 1966 and it’s 995 silver dollars in 2016. It’s just a currency debasement bubble wiping out the middle class who are pissed off at the left and the right. It’s the evil counterfeiting bankers who are ruining the world. Add 1913 (Fed created) plus 20 years, 1923, roaring twenties, then 1943, World War, 1963, Vietnam and riots, affirmative action ethnic cleansing quotas to wipe out white males, then 1983, the beginning of the great counterfeiting and printing a buble from $1 Trillion US public debt to $20 Trillion by Obama. It’s all about the debt bubble transferring wealth from the middle class to the poor and rich. Connect the dots John. It’s the debt bubble, and it has to pop. Prepare yourself accordingly. Good luck to us all. June 19, 2016, 12:54 p.m.
Another thoughtful article. Thanks. However I don’t see how we exit this crisis and begin a period of prosperity. You point out that larger government and an incomprehensible growth in debt will be one of the crisis’s developments. This super debt along with falling birth rates and greater government intrusiveness with all its corruption and inefficiencies will not usher in a period of growth. Will there be a global debt restructuring? How will things change to form the foundation of growth? No growth, no prosperity. Furthermore, technology will likely continue to supplant workers. I fear that the complexity of global economics has outstripped our ability to comprehend it. Just yesterday Harvard prifesdor Mankiw said he had no idea which of five different explanations of the current stagnation was correct. I thought that was astonishing. I can tell him. We have spent our future. We borrowed from future growth to live beyond our means and the future is now. The only solution is the cleansing of massive deflation and government debt default and any honest economist knows it. However no one wants to be the hero and sacrifice for future generations like your article says. June 19, 2016, 11:58 a.m.
An interesting article. One thing that is different in this crisis cycle from others is that children and young adults are now being taught that “mankind is destroying the earth”. As a scientist, I know this is NOT true, but when the president and some greedy scientists say “it’s proven fact”, the teachers believe it is so and pass it on to their students. I doubt that our species can pull ourselves out of the crisis cycle when the millennials and homeland generations believe “man is responsible for everything that is bad and that the earth cannot survive us”, “everything man does harms the earth”,“prosperity is bad”, “progress is bad”, “wealth is evil”, etc. It is sad that young people will carry these thoughts for the rest of their lifes even though they are not true. Keep up the good work.